The Chicago Teachers Union is sponsoring a forum with historian Diane Ravitch at Lane Technical High School, 2501 W. Addison Ave., Chicago, IL beginning at four p.m. after school on Monday, October 15, 2012. Admission is $10 per person. 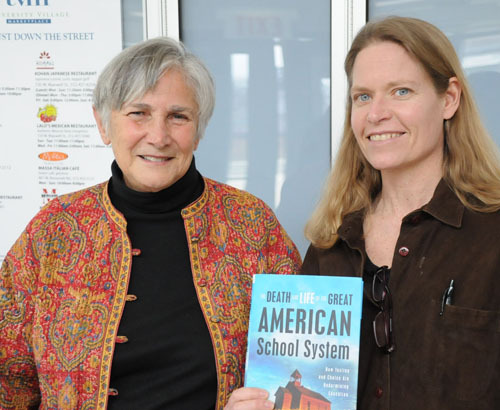 Historian Diane Ravitch and Substance Editor (and Steinmetz High School journalism teacher) Sharon Schmidt during a previous visit by Ravitch to Chicago. Diane was in town on March 12, 2011 for a CTU forum at the University of Illinois Forum and has been a vocal supporter of the union and President Karen Lewis since 2010. Substance photo by George N. Schmidt.The event is billed as "a conversation with Diane Ravitch noted public education advocate and author of The Death and Life of the Great American School System..." The topic will be "How Testing and Choice Are Undermining Education". On Monday, October 15, she will also be doing two other events. In the morning, at 7:30 a.m., she will be doing a City Club breakfast at Maggiano's restaurant. In the late morning (beginning at 11:30 a.m.), she will be participating in the CREATE conference at the University of Illinois at Chicago. Additionally (see below), she has been supporting CTU during the current contract struggle and strike through her writings, which are published in some of the most prestigious publications in the USA, and through her daily blog. Since the publication of her latest book, "The Death and Life of the Great American School System," Dr. Ravitch has become one of the most outspoken critics of corporate school reform in the USA. During the recent Chicago Teachers Strike of 2012, she provided support to the Chicago Teachers Union through her writings. During the Chicago Teachers Strike of 2012, she provided almost daily support and commentary to the CTU and President Karen Lewis. The two are friends. Throughout the strike and during the preparation to it, Ravitch provided support to the CTU on her blog and through other means. Mayor Rahm Emanuel has tried to bully the Chicago Teachers Union and its leader Karen Lewis. Lewis was elected by the members because they knew she would stand up for them. 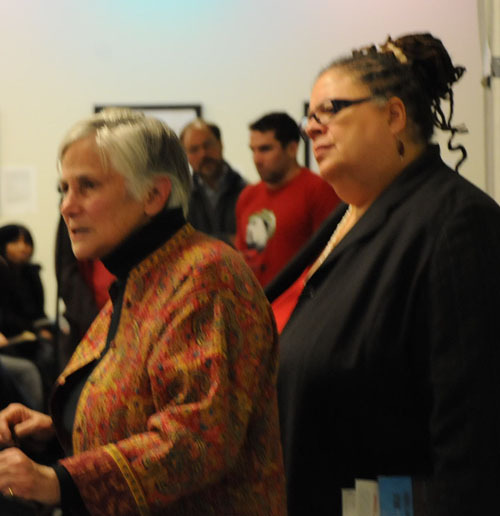 Diane Ravitch (left) and Karen Lewis at the University of Illinois Chicago for the CTU forum on March 12, 2011. Ravitch began supporting Karen Lewis and the new CTU leadership team almost as soon as the election of 2010 put the CORE leaders in power in the nation's third largest school system, and has been providing a great deal of support since. Substance photo by George N. Schmidt.Emanuel has the support of the Wall Street hedge fund managers organization, somewhat absurdly called Democrats for Education Reform. He also has the other big-monied people in Chicago, as mentioned in this article in the Chicago Tribune, including billionaire Penny Pritzker. The article mentions that DFER staged a protest at union headquarters to oppose a strike. I wonder how many hedge fund managers send their children to Chicago public schools. I am trying to imagine hedge fund managers marching in front of union headquarters and carrying signs. I am guessing that what happened was that they staged a protest, meaning that they hired out-of-work actors to carry protest signs. Maybe the unemployed actors have children in the Chicago public schools. The great thing about having Karen Lewis there is that every teacher in America knows she will stand strong for them. She will not sell them out. And she will not sell out the children. She knows that teachersâ€™ working conditions are childrenâ€™s learning conditions. Both Rahm and Penny know that too. That is why they don not send their children to the schools for which they are responsible. They send their children to a school with small classes, lots of arts and physical education, a great library, experienced teachers, and a full curriculum. The school where they send their children doesnâ€™t give standardized tests and does not evaluate teachers by their studentsâ€™ test scores. One of the most impressive things about Diane Ravitch's work today is that she maintains her blog on a daily basis, filling it with commentary about current events. During the Chicago Teachers Strike of 2012, Diane not only sustained her support for the strike, but got her analyses into prominent publications such as the New York Review of Books, which influence elite opinion. While The New York Times and The Wall Street Journal were first ignoring the story and then trying to catch up, because of her contact with the CTU, she was already ahead of the story, as reporters put it. Below are two writings Diane posted to the New York Review of Books. The first was during the Chicago strike. The second was an earlier lengthy analysis of the current state of "school reform" in the USA. Two Visions for Chicago's Schools by Diane Ravitch. New York Review of Books on line, September 12, 2012. According to most news reports, the teachers in Chicago are striking because they are lazy and greedy. Or they are striking because of a personality clash between Mayor Rahm Emanuel and union president Karen Lewis. Or because this is the last gasp of a dying union movement. Or because Emanuel wants a longer school day, and the teachers oppose it. None of this is true. All reports agree that the two sides are close to agreement on compensation issues. It is not money that drove them apart. Last spring the union and the school board agreed to a longer school day, so that is not the issue either. The strike is a clash of two very different visions about what is needed to transform the schools of Chicago and the nation. Chicago schools have been a petri dish for school reform for nearly two decades. Beginning in 1995, they came under tight mayor control, and Mayor Richard Daley appointed his budget director, Paul Vallas, to run the schools; Vallas set out to raise test scores, open magnet schools and charter schools, and balance the budget. When Vallas left to run for governor (unsuccessfully in 2002), Daley selected another non-educator, Arne Duncan, who was a Vallas deputy and a strong advocate of charter schools. Vallas had imposed reform after reform, and Duncan added even more. Duncan called his program Renaissance 2010, with the goal of closing low-performing schools and opening one hundred new schools. Since 2009, Duncan has been President Obama's Education Secretary, where he launched the $5 billion Race to the Top program, which relies heavily on student test scores to evaluate teacher quality, to award merit pay, and to close or reward schools; it also encourages the proliferation of privately managed charter schools. This is the vision that Washington now supports, and that the Chicago school board, appointed by current mayor and former Obama chief of staff Rahm Emanuel, endorses: more school closings, more privately managed schools, more testing, merit pay, longer school hours. But in Chicago itself, where these reforms started, most researchers agree that the results have been mixed at best. There has been no renaissance. After nearly twenty years of reform, the schools of Chicago remain among the lowest performing in the nation. The Chicago Teachers Union has a different vision: it wants smaller classes, more social workers, air-conditioning in the sweltering buildings where summer school is conducted, and a full curriculum, with teachers of arts and foreign languages in every school. Some schools in Chicago have more than forty students in a class, even in kindergarten. There are 160 schools without libraries; more than 40 percent have no teachers of the arts. What do the teachers want? The main sticking point is the seemingly arcane issue of teacher evaluations. The mayor wants student test scores to count heavily in determining whether a teacher is good (and gets a bonus) or bad (and is fired). The union points to research showing that test-based evaluation is inaccurate and unfair. Chicago is a city of intensely segregated public schools and high levels of youth violence. Teachers know that test scores are influenced not only by their instruction but by what happens outside the classroom. The strike has national significance because it concerns policies endorsed by the current administration; it also raises issues found all over the country. Not only in Chicago but in other cities, teachers insist that their students need smaller classes and a balanced curriculum. Reformers want more privately-managed charter schools, even though they typically get the same results as public schools. Charter schools are a favorite of the right because almost 90 percent of them are non-union. Teachers want job protection so that they will not be fired for capricious reasons and have academic freedom to teach controversial issues and books. Reformers want to strip teachers of any job protections. The strike is a headache for President Obama, because he is trapped between two allies that he needs for the November election. He needs the support of organized labor, especially the four million teachers, many of whom enthusiastically campaigned for him in 2008. But how can he abandon Rahm Emanuel? Even more problematic for the president, the teachers are rebelling against the core principles of the Obama administration's Race to the Top program. That program, which provides grants to states, including Illinois, that demonstrate they are pursuing its reforms, relies heavily on standardized testing to enable states to evaluate teachers, to award merit pay, and to identify schools as â€œfailingâ€ and set them up for mass firings and closure. Ultimately, the strike may be resolved around seemingly technical issues having to do with pay scales (whether teachers continue to earn more for degrees and experience) and regulations governing layoffs and rehiring. But what is likely to remain are the biggest issues: Will carrots and sticks for teachers produce better education for students? Should Chicago continue privatizing public education? Are standardized tests appropriate measures of teacher quality and school quality? Do school closings lead to better schools? Can school reform overcome concentrated racial segregation and poverty? Can our society afford to give children in urban districts a far higher quality of education than is now available? Predictably, the striking teachers are taking a beating in the national media, which admires Rahm Emanuel's tough position, but teachers elsewhere are rallying around the Chicago strikers. Many see them as standing up for teachers and their right to bargain collectively, a right that was settled -- or so it seemed -- during the Depression with the passage of the Wagner Act of 1935, which protected the right of workers to join unions. Education researchers, who have been concerned about the overuse and misuse of standardized testing, may fear to see issues settled politically instead of by reference to evidence. If the mayor wins, it will be perceived as a victory for a continued assault on teachers and their unions and an endorsement of school closings and privatized charters. If the teachers win, which is a long shot, the children of Chicago might get smaller classes and a better curriculum. The best outcome would be an amicable settlement, one that assures not more testing but better education. September 12, 2012, 5:45 p.m.
RAVITCH IN PRINT IN THE NEW YORK REVIEW OF BOOKS:. The most comprehensive recent work by Diane Ravitch countering the claims of corporate school reform appeared in print in The New York Review of books in March 2012 in two parts. They are reprinted below for Substance readers to review. A photo with the article by Tuomas Uusheimo showed the KirkkojÃ¤rvi School in Espoo, Finland, which accommodates about 770 students aged seven to sixteen and also includes a preschool for six-year-olds; from the Museum of Finnish Architectureâ€™s exhibition â€˜The Best School in the World: Seven Finnish Examples from the 21st Century,â€™ which will be on view at the American Institute of Architectsâ€™ Center for Architecture in New York City this fall. In recent years, elected officials and policymakers such as former president George W. Bush, former schools chancellor Joel Klein in New York City, former schools chancellor Michelle Rhee in Washington, D.C., and Secretary of Education Arne Duncan have agreed that there should be â€œno excusesâ€ for schools with low test scores. The â€œno excusesâ€ reformers maintain that all children can attain academic proficiency without regard to poverty, disability, or other conditions, and that someone must be held accountable if they do not. That someone is invariably their teachers. Nothing is said about holding accountable the district leadership or the elected officials who determine such crucial issues as funding, class size, and resource allocation. The reformers say that our economy is in jeopardy, not because of growing poverty or income inequality or the outsourcing of manufacturing jobs, but because of bad teachers. These bad teachers must be found out and thrown out. Any laws, regulations, or contracts that protect these pedagogical malefactors must be eliminated so that they can be quickly removed without regard to experience, seniority, or due process. The belief that schools alone can overcome the effects of poverty may be traced back many decades but its most recent manifestation was a short book published in 2000 by the conservative Heritage Foundation in Washington, D.C., titled No Excuses. In this book, Samuel Casey Carter identified twenty-one high-poverty schools with high test scores. Over the past decade, influential figures in public life have decreed that school reform is the key to fixing poverty. Bill Gates told the National Urban League, â€œLetâ€™s end the myth that we have to solve poverty before we improve education. I say itâ€™s more the other way around: improving education is the best way to solve poverty.â€ Gates never explains why a rich and powerful society like our own cannot address both poverty and school improvement at the same time. For a while, the Gates Foundation thought that small high schools were the answer, but Gates now believes that teacher evaluation is the primary ingredient of school reform. The Gates Foundation has awarded hundreds of millions of dollars to school districts to develop new teacher evaluation systems. In 2009, the nationâ€™s chief reformer, Secretary of Education Arne Duncan, launched a $4.35 billion competitive program called Race to the Top, which required states to evaluate teachers by student test scores and to remove the limits on privately managed charter schools. The main mechanism of school reform today is to identify teachers who can raise their studentsâ€™ test scores every year. If the scores go up, reformers assume, then the students will enroll in college and poverty will eventually disappear. This will happen, the reformers believe, if there is a â€œgreat teacherâ€ in every classroom and if more schools are handed over to private managers, even for-profit corporations. The reformers donâ€™t care that standardized tests are prone to measurement error, sampling error, and other statistical errors.1 They donâ€™t seem to care that experts like Robert L. Linn at the University of Colorado, Linda Darling-Hammond at Stanford, and Helen F. Ladd at Duke, as well as a commission of the National Research Council, have warned about misuse of standardized tests to hold individual teachers accountable with rewards or sanctions. Nor do they see the absurdity of gauging the quality of a teacher by the results of a multiple-choice test given to students on one day of the year. Testing can provide useful information, showing students and teachers what is and is not being learned, and scores can be used to diagnose learning problems. But bad things happen when tests become too consequential for students, teachers, and schools, such as narrowing the curriculum only to what is tested or cheating or lowering standards to inflate scores. In response to the federal and state pressure to raise test scores, school districts across the nation have been reducing the time available for the arts, physical education, history, civics, and other nontested subjects. This will not improve education and is certain to damage its quality. No nation in the world has eliminated poverty by firing teachers or by handing its public schools over to private managers; nor does research support either strategy.2 But these inconvenient facts do not reduce the reformersâ€™ zeal. The new breed of school reformers consists mainly of Wall Street hedge fund managers, foundation officials, corporate executives, entrepreneurs, and policymakers, but few experienced educators. The reformersâ€™ detachment from the realities of schooling and their indifference to research allow them to ignore the important influence of families and poverty. The schools can achieve miracles, the reformers assert, by relying on competition, deregulation, and management by dataâ€”strategies similar to the ones that helped produce the economic crash of 2008. In view of the reformersâ€™ penchant for these strategies, educators tend to call them â€œcorporate reformers,â€ to distinguish them from those who understand the complexities of school improvement. The corporate reformersâ€™ well-funded public relations campaign has succeeded in persuading elected officials that American public education needs shock therapy. One is tempted to forget that the United States is the largest and one of the most successful economies in the world, and that some part of this success must be attributed to the institutions that educated 90 percent of the people in this nation. Faced with the relentless campaign against teachers and public education, educators have sought a different narrative, one free of the stigmatization by test scores and punishment favored by the corporate reformers. They have found it in Finland. Even the corporate reformers admire Finland, apparently not recognizing that Finland disproves every part of their agenda. It is not unusual for Americans to hold up another nation as a model for school reform. In the mid-nineteenth century, American education leaders hailed the Prussian system for its professionalism and structure. In the 1960s, Americans flocked to England to marvel at its progressive schools. In the 1980s, envious Americans attributed the Japanese economic success to its school system. Now the most favored nation is Finland, and for four good reasons. First, Finland has one of the highest-performing school systems in the world, as measured by the Programme for International Student Assessment (PISA), which assesses reading, mathematical literacy, and scientific literacy of fifteen-year-old students in all thirty-four nations of the Organisation for Economic Co-operation and Development (OECD), including the United States. Unlike our domestic tests, there are no consequences attached to the tests administered by the PISA. No individual or school learns its score. No one is rewarded or punished because of these tests. No one can prepare for them, nor is there any incentive to cheat. Second, from an American perspective, Finland is an alternative universe. It rejects all of the â€œreformsâ€ currently popular in the United States, such as testing, charter schools, vouchers, merit pay, competition, and evaluating teachers in relation to the test scores of their students. Third, among the OECD nations, Finnish schools have the least variation in quality, meaning that they come closest to achieving equality of educational opportunityâ€”an American ideal. Fourth, Finland borrowed many of its most valued ideas from the United States, such as equality of educational opportunity, individualized instruction, portfolio assessment, and cooperative learning. Most of its borrowing derives from the work of the philosopher John Dewey. improving the teaching force, limiting student testing to a necessary minimum, placing responsibility and trust before accountability, and handing over school- and district-level leadership to education professionals. I met Pasi Sahlberg in December 2010. I was one of a dozen educators invited to the home of the Finnish consul in New York City to learn about the Finnish education system on the day after the release of the latest international test results. Once again, Finland was in the top tier of nations, as it has been for the past decade. Sahlberg assured the guests that Finnish educators donâ€™t care about standardized test scores and welcomed the international results only because they protected the schools against conservative demands for testing and accountability. Sahlberg invited me to Finland to tour several schools, which I eventually did in September 2011. With Sahlberg as my guide, I visited bright, cheerful schools where students engaged in music, dramatics, play, and academic studies, with fifteen-minute recesses between classes. I spoke at length with teachers and principals in spacious, comfortable lounges. Free from the testing obsession that now consumes so much of the day in American schools, the staff has time to plan and discuss the students and the program. Before I left Finland, Sahlberg gave me a book called The Best School in the World: Seven Finnish Examples from the 21st Century,3 about the architecture of Finnish schools. The book is based on an exhibition presented at the Venice Biennale of Architecture in 2010. When we visited one of the featured schools, I thought, how delightful to discover a nation that cares passionately about the physical environment in which children learn and adults work. To be sure, Finland is an unusual nation. Its schools are carefully designed to address the academic, social, emotional, and physical needs of children, beginning at an early age. Free preschool programs are not compulsory, but they enroll 98 percent of children. Compulsory education begins at the age of seven. Finnish educators take care not to hold students back or label them as â€œfailing,â€ since such actions would cause student failure, lessen student motivation, and increase social inequality. After nine years of comprehensive schooling, during which there is no tracking by ability, Finnish students choose whether to enroll in an academic or a vocational high school. About 42 percent choose the latter. The graduation rate is 93 percent, compared to about 80 percent in the US. Finlandâ€™s highly developed teacher preparation program is the centerpiece of its school reform strategy. Only eight universities are permitted to prepare teachers, and admission to these elite teacher education programs is highly competitive: only one of every ten applicants is accepted. There are no alternative ways to earn a teaching license. Those who are accepted have already taken required high school courses in physics, chemistry, philosophy, music, and at least two foreign languages. Future teachers have a strong academic education for three years, then enter a two-year masterâ€™s degree program. Subject-matter teachers earn their masterâ€™s degree from the universityâ€™s academic departments, notâ€”in contrast to the USâ€”the department of teacher education, or in special schools for teacher education. Every candidate prepares to teach all kinds of students, including students with disabilities and other special needs. Every teacher must complete an undergraduate degree and a masterâ€™s degree in education. Because entry into teaching is difficult and the training is rigorous, teaching is a respected and prestigious profession in Finland. So selective and demanding is the process that virtually every teacher is well prepared. Sahlberg writes that teachers enter the profession with a sense of moral mission and the only reasons they might leave would be â€œif they were to lose their professional autonomyâ€ or if â€œa merit-based compensation policy [tied to test scores] were imposed.â€ Meanwhile, the United States is now doing to its teachers what Finnish teachers would find professionally reprehensible: judging their worth by the test scores of their students. Finlandâ€™s national curriculum in the arts and sciences describes what is to be learned but is not prescriptive about the details of what to teach or how to teach it. The national curriculum requires the teaching of a mother tongue (Finnish or Swedish), mathematics, foreign languages, history, biology, environmental science, religion, ethics, geography, chemistry, physics, music, visual arts, crafts, physical education, health, and other studies. Most visitors to Finland discover elegant school buildings filled with calm children and highly educated teachers. They also recognize the large amount of autonomy that schools enjoy: little interference by the central education administration in schoolsâ€™ everyday lives, systematic methods for addressing problems in the lives of students, and targeted professional help for those in need. The children of Finland enjoy certain important advantages over our own children. The nation has a strong social welfare safety net, for which it pays with high taxes. More than 20 percent of our children live in poverty, while fewer than 4 percent of Finnish children do. Many children in the United States do not have access to regular medical care, but all Finnish children receive comprehensive health services and a free lunch every day. Higher education is tuition-free. Sahlberg recognizes that Finland stands outside what he refers to as the â€œGlobal Education Reform Movement,â€ to which he appends the apt acronym â€œGERM.â€ GERM, he notes, is a virus that has infected not only the United States, but the United Kingdom, Australia, and many other nations. President George W. Bushâ€™s No Child Left Behind law and President Barack Obamaâ€™s Race to the Top program are examples of the global education reform movement. Both promote standardized testing as the most reliable measure of success for students, teachers, and schools; privatization in the form of schools being transferred to private management; standardization of curriculum; and test-based accountability such as merit pay for high scores, closing schools with low scores, and firing educators for low scores. In contrast, the central aim of Finnish education is the development of each child as a thinking, active, creative person, not the attainment of higher test scores, and the primary strategy of Finnish education is cooperation, not competition. I will consider the Teach for America organizationâ€”the subject of Wendy Koppâ€™s A Chance to Make Historyâ€”in comparison to the Finnish model in a second article. â€”This is the first of two articles. Part Two. How, and How Not, to Improve the Schools, published MARCH 22, 2012 by Diane Ravitch in The New York Review of Books. In his 2012 State of the Union address, President Barack Obama proposed that teachers should â€œstop teaching to the testâ€ and that the nation should â€œreward the best onesâ€ and â€œreplace teachers who just arenâ€™t helping kids learn.â€ This all sounds sensible, but it is in fact a contradictory message. The presidentâ€™s signature education program, called Race to the Top, encourages states to award bonuses to teachers whose students get higher test scores (they are, presumably â€œthe best onesâ€) and to fire teachers if their students get lower test scores (presumably the teachers â€œwho just arenâ€™t helping kidsâ€). If teachers want to stay employed, they must â€œteach to the test.â€ The president recommends that teachers stop doing what his own policies make necessary and prudent. Like George W. Bushâ€™s No Child Left Behind, Barack Obamaâ€™s Race to the Top program is part of what Pasi Sahlberg calls â€œthe Global Education Reform Movement,â€ or GERM. GERM demands teaching to the test. GERM assumes that students must be constantly tested, and that the results of these tests are the most important measures and outcomes of education. The scores can be used not only to grade the quality of every school, but to punish or reward students, teachers, principals, and schools. Those at the top of the education system, the elected officials and leaders who make the rules, create the budgets, and allocate resources, are never accountable for the consequences of their decisions. GERM assumes that people who work in schools need carrots and sticks to persuade (or compel) them to do their best. In Finland, the subject of the first part of this article,1 teachers work collaboratively with other members of the school staff; they are not â€œheld accountableâ€ by standardized test scores because there are none. Teachers devise their own tests, to inform them about their studentsâ€™ progress and needs. They do their best because it is their professional responsibility. Like other professionals, as Pasi Sahlberg shows in his book Finnish Lessons, Finnish teachers are driven by a sense of intrinsic motivation, not by the hope of a bonus or the fear of being fired. Intrinsic motivation is also what they seek to instill in their students. In the absence of standardized testing by which to compare their students and their schools, teachers must develop, appeal to, and rely on their studentsâ€™ interest in learning. The GERM model seeks to emulate the free market, by treating parents as consumers and students as products, with teachers as compliant workers who are expected to obey orders and follow scripts. Advocates of GERM often are hostile to teachersâ€™ unions, which are considered obstacles to the managerial ethos necessary to control the daily life of a school. Unions also make it hard, if not impossible, to carry out cost savings, such as removing the highest-paid teachers and replacing them with low-wage, entry-level teachers. Finlandâ€™s success confounds the GERM theorists, because almost every teacher and principal in Finland belongs to the same union. The union works closely with the Ministry of Education to improve the quality of education, and it negotiates for better salaries, benefits, and working conditions for educators. The American school reform movementâ€”the odd coalition of corporate- friendly Democrats, right-wing Republicans, Tea Party governors, Wall Street executives, and major foundationsâ€”proudly advocates the tenets of GERM. More testing, more privately managed schools, more deregulation, more firing of teachers, more school closings, they believe, and eventually every student will go to college and poverty will be eliminated. There is little evidence to support this approach. The Duke University economist Helen F. Ladd recently delivered a major address titled â€œEducation and Poverty: Confronting the Evidence,â€ in which she demonstrated that poverty drags down academic performance, not only in the US, but in other nations as well.2 To argue, as so many of the corporate reformers blithely do, that poverty is used as â€œan excuseâ€ for bad teachers is either naive or ignorant. Or it may be a way of avoiding the politically difficult subjects of poverty and income inequality, both of which are rising and threaten the well-being of our society. The corporate reformers believe that entrepreneurship will unleash a new era of innovation and creativity, but it seems mostly to have unleashed canny entrepreneurs who seek higher test scores by any means possible (such as excluding students with disabilities or students learning English as a second language) or who seek maximum profit. One facet of the business plan for reform is reducing the cost of instruction. Many governors tackle this head-on by slashing the budget and laying off teachers. Others, claiming to act in the name of â€œreform,â€ replace teachers with online instruction. Another way to reduce costs is to rely on inexperienced teachers, who are at the bottom of the salary scale and are likely to leave teaching for more remunerative, less demanding jobs before they are eligible for a pension. Experienced teachers are fleeing American public education in response to the testing demands of No Child Left Behind, which reduce professional autonomy. According to federal data, the â€œmodal yearsâ€ of teacher experience in our public schools in 1987â€“1988 was fifteen, meaning that there were more teachers with fifteen years of experience than any other group. By 2007â€“2008, the largest number of teachers were in their first year of teaching. In response to the ongoing drumbeat of public opprobrium inspired by corporate-style school reform, we are losing the experienced teachers that students and new teachers need. Unlike Finland, where entry into teaching is limited and competitive, the United States has low standards for new teachers. In Finland the profession is highly esteemed; in the United States it is not. Some states require masterâ€™s degrees, some do not. The difference is not compensation, but the high degree of professionalism that Finland expects of its teachers. In the United States, some states and districts require teachers to have a degree in the subject they teach or to pass a test to demonstrate their mastery of their subject, some do not. Schools of education are held in low esteem within the university system. Online universities now award the largest numbers of masterâ€™s degrees in education. The teaching profession in the United States is a revolving door. Itâ€™s easy to enter, and many teachers leaveâ€”up to 40 to 50 percentâ€”in their first five years as teachers. The turnover is highest in low-scoring urban districts. We do not support new teachers with appropriate training and mentoring, and we have a problem retaining teachers. No other profession in the United States has such a high rate of turnover. For those who take seriously the need to improve the teaching profession, this would seem to be the right time to raise entry standards and to improve teacher education. If we were to learn from Finlandâ€™s example, we would select well-educated candidates for entry into teaching, require academic excellence and a masterâ€™s degree, and make certification as an education professional meaningful. But corporate reformers have shown no interest in raising standards for the teaching profession. They believe that entry-level requirements such as certification, masterâ€™s degrees, and other credentials are unrelated to â€œperformance,â€ that is, student test scores. They also scorn seniority, experience, tenure, and other perquisites of the profession. Instead, they believe that a steady infusion of smart but barely trained novices will change the face of teaching. In no other field but education would such judgments be tolerated, because they reinforce the low status of education as a profession, one where no prolonged preparation is thought necessary. The corporate reformersâ€™ favorite remedy for the ills of the profession is the Teach for America program. By now, everyone in the education field knows the story of how the Princeton student Wendy Kopp developed the idea for Teach for America as her senior thesis in 1989, then raised millions of dollars from corporations and turned her idea into a wildly successful brand. TFA enlists new graduates from the nationâ€™s best colleges and universities, who commit themselves to teach in distressed urban and rural schools for two years. In the past decade, Kopp has raised hundreds of millions of dollars for TFA. Just in the past eighteen months, TFA received $50 million from the US Department of Education, $49.5 million from the ultra-conservative Walton Family Foundation, and $100 million from a consortium of other foundations, as well as additional millions from corporations and other major donors. Each year, TFA selects several thousand idealistic young people, gives them five weeks of training, and sends them out to teach. The school districts pay members of TFA a starting teacherâ€™s salary and typically pay TFA $5,000 for each new teacher. TFA, like the Peace Corps, is an admirable idea. The young people who join TFA are typically among our brightest students from top-tier universities. On some campuses, more students apply to TFA than to any other prospective employer. Like others who become teachers, they want to make a difference in the lives of children, particularly those who are poor. And yet TFA has aroused the anger of veteran educators because of the organizationâ€™s arrogance. TFA claims that its young recruits are better than other teachers, presumably because they are carefully selected and therefore smarter than the average teacher. It also claims that its corps members produce remarkable results even in the two or three years that most are likely to teach. But researchers such as Linda Darling-Hammond at Stanford, Barbara Torre Veltri at Northern Arizona University, Philip Kovacs at the University of Alabama, and Julian Vasquez Heilig at the University of Texas have challenged TFAâ€™s claims.3 They maintain that the students of TFAâ€™s young recruits have not achieved the remarkable test score gains that the organization boasts about. Critics ask why inexperienced young graduates are permitted to teach the nationâ€™s most vulnerable children. Veteran educators resent the suggestion that new college graduates have arrived to save their schools; they know that novices with a few weeksâ€™ training, no matter how smart and idealistic, canâ€™t be expected to produce dramatic results in two or three years as a teacher. In A Chance to Make History, Kopp ignores the critics and concentrates instead on telling stories about successful classrooms and schools led by TFA alumni and teachers. The message of the book is that TFA has discovered the secrets to producing astonishing changes in schools and needs to keep growing to bring these changes to entire districts. total central control over the indicators used to track progressâ€¦such as college matriculation and completion of eighth grade, student attrition, and teacher retention. Other nonnegotiables include more time and the requirement that every adult who works at KIPP chooses to be there. Some of those schools offer the extra health services that our society apparently canâ€™t afford to provide to all children, and some provide extra tutoring and help for families. In the schools she calls transformational, poverty does not get in the way of high test scores. However, her evidence is shaky. She says that New York City is a model where â€œthe needle is moving against the achievement gap in ways that are meaningful for students.â€ She refers to the cityâ€™s gains on federal tests, but does not acknowledge that the gains were no larger than those of other urban districts. She refers to the cityâ€™s improvement on New York State tests, but curiously fails to mention that those dramatic gains evaporated following a widely publicized investigation in July 2010: after the state acknowledged that its tests had become easier over time, the cityâ€™s test scores dropped back almost to where they had been in 2002, and the achievement gaps among racial and ethnic groups reverted as well. Is Washington, D.C., a promising model? Kopp believes that the TFA alumni who have managed the districtâ€™s schools since 2007 have made remarkable improvements by imposing new demands for data, measurement, and accountability on every school, as well as a new teacher evaluation system. But a few months after Koppâ€™s book appeared, USA Today revealed evidence of a major cheating scandal. The newspaper disclosed that test scores at certain schools showed a remarkably high rate of erasures from wrong to right. The investigation centered on a school that Chancellor Michelle Rhee had celebrated, where scores rose sharply in a short period of time. Kopp could not have known about the cheating allegations, but she surely knew that the districtâ€™s steady improvement in reading and mathematics scores on the federally sponsored tests called the National Assessment of Educational Progress had begun in 2003, long before the arrival in 2007 of Rhee, a TFA alumna, as chancellor of schools for the district. Unfortunately, despite its improved test scores, the District of Columbia continues to have the largest achievement gap between white and black students in the nationâ€”fully double that of most other big cities tested by the federal government. As for New Orleans, it is the poster child of the corporate reformers because the public school system and the teachersâ€™ union were wiped out by Hurricane Katrina. Now about 70 percent of the students in the district attend charter schools, staffed by TFA and other young teachers. Reformers have portrayed New Orleans as an educational miracle, and the media have faithfully parroted this characterization as proof that nonunion charter schools are successful. But few paid attention when the state of Louisiana recently released grades for every school in the state and 79 percent of the charter schools formed by the state received a grade of D or F.
Teach for America is a worthy idea. It is wonderful to encourage young people to commit themselves to public service for two years. The program would be far more admirable if the organization showed some modesty, humility, and realism in its claims for its inexperienced teachers. Many foundations, corporations, and even the US Department of Education treat TFA as a systemic solution to the critical needs of the teaching profession. But it is foolhardy to expect that a profession of more than three million teachers will be transformed by the annual addition of a few thousand college graduates who agree to stay for only two years. Teach for America is no substitute for the deep changes needed in the recruitment, support, and retention of career educators. Our nationâ€™s schools need professional teachers who have had the kind of intensive preparation and practice that nations like Finland insist upon. The Peace Corps sends out young people to do whatever is required in impoverished communities, not to serve as full-fledged Foreign Service officers for two years. Nor is it realistic to claim that these young people, because they are smart, can fix American schools and end the inequities in American society by teaching for a few years. If only it were that easy!